and the stirring bar used to mix or stir something, the brush used to clean the glassware. This Graduated glassware set is suitable for Lab, food , beverage, wine making or animal's feeding use. Withstands continuous usage at 350°F. Molded-in graduation lines on the back of the cylinders ensure easier, more accurate fluid level readings. ★Our commitment:Any broken and any unsatisfied, please contact us to get a pleased answer. 8 pieces glassware: 3 pieces of glass measuring glassware. 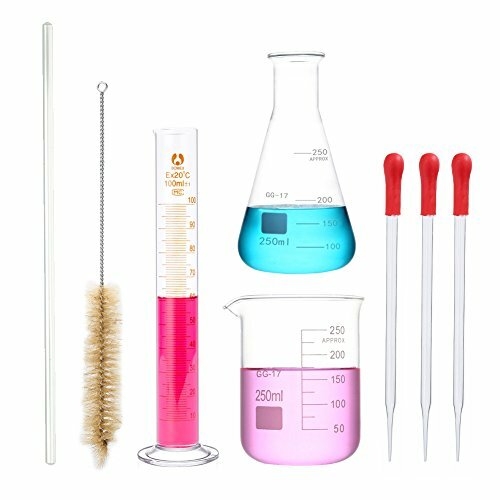 100ML cylinder, 250ML beaker, 250ML flask, three 20cm dropper, one 30cm stir bar and one glassware brush. Meet all your measuring needs. High quality: 3.3 borosilicate glass, 121C/250F conducted in a slow and careful manner to avoid breakage. Heavy Duty Reusable: Glass material, Environment friendly and reusable. Perfect package: Wrapped with foam model, safe and beautiful. 100% Money back guarantee:if you are not COMPLETELY satisfied we will give you your money back.